Did you know that it only takes a speck of lead dust the size of a grain of salt to poison a child? 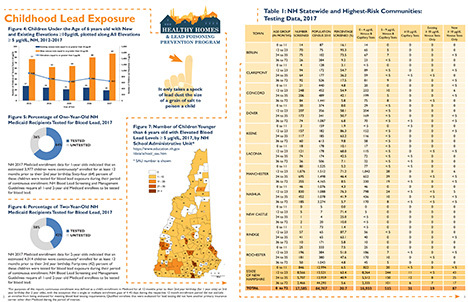 In 2017, 652 NH children under the age of 6 years old were identified with elevated blood lead levels 5ug/dL or higher (NO level of lead is safe). 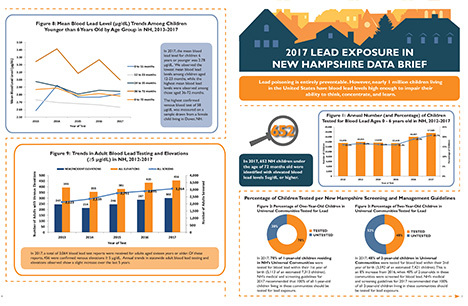 This data brief provides more information about lead exposure in children in NH: https://files.constantcontact.com/e3cc0f9d001/1219e3c6-12a2-4f57-beb7-50e76144696b.pdf. Houses with lead paint that have been treated by being painted over are not necessarily safe. Lead exposure can occur anywhere that ‘vintage’ lead paint has not been painted over, anywhere that paint is peeled, anywhere that paint gets abraded (double-hung windows, door casings, painted flooring, etc.). Some homes are old enough to have lead solder in their pipes (very old ones might have lead pipes!). Most have water fixtures that are older than 2014, when regulation required reduced lead content. You can take your health into your own hands and check out what is around you by testing surfaces in your homes, and having your water tested.